I looked at many options for our sailing holiday, the one that ticked the most boxes was a yacht complete with skipper (so we could all be involved as much or as little as we liked and learn as we went along) a chef (which meant I didn’t have to worry about buying and cooking food and on board watersports for the kids/us (paddle boards, water skis, wakeboard, windsurfer, ringo, snorkeling and fishing gear and of course getting involved with the sailing). Not forgetting comfortable air-conditioned cabins with en-suite bathrooms. 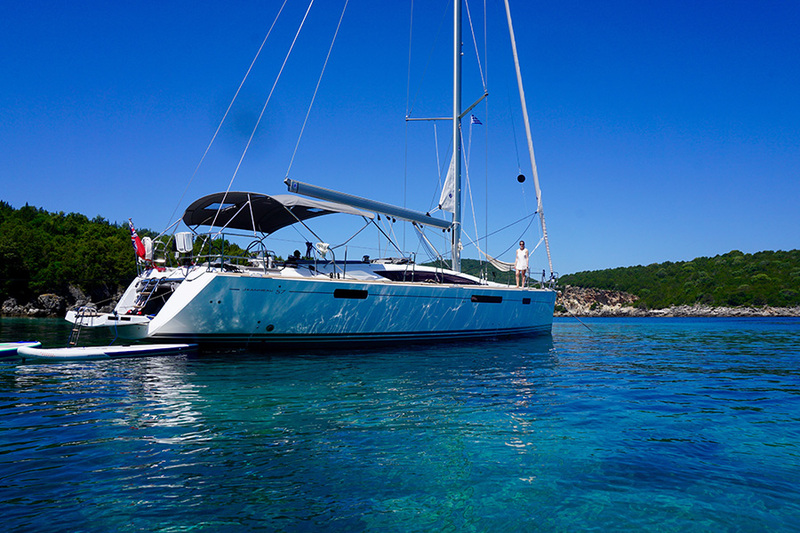 We had the most amazing week in May on board a brand new 57 foot luxury yacht exploring the beautiful Ionian Islands of Corfu, Paxos and Antipaxos. There wasn’t a lot of wind during the week and so the sails only went up once but we did learn a lot about living on board a yacht! 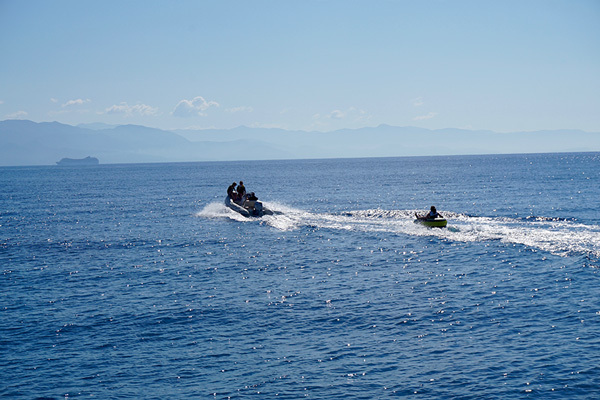 Some of the experiences were truly magical, from staying in a remote bay on the border of Albania and Greece with the gentle sound of shepherds herding their goats in the evening, to the traditional ports of Gaios on Paxos. At one point we were the only boat moored in the idyllic Emerald Bay, Antipaxos where we spent a night in tranquility listening to the gentle lapping of waves, watching the sun set. 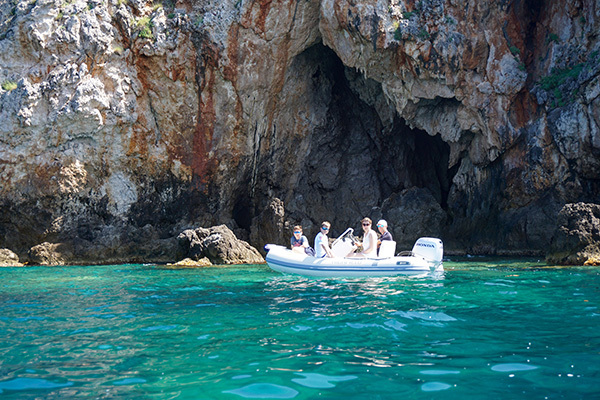 Let’s not forget our day exploring the caves on the west side of Antipaxos – while the boys and I joined the skipper in the rib, my husband paddled behind in his trusty folding kayak. Our last night was spent in the Venetian port – Mandraki Harbour – which is located in the Old Fortress of Corfu. This is a beautiful location directly under the steep walls of the fort and a short stroll into the center of the old town of Corfu. So, were the boys bored? Absolutely not! 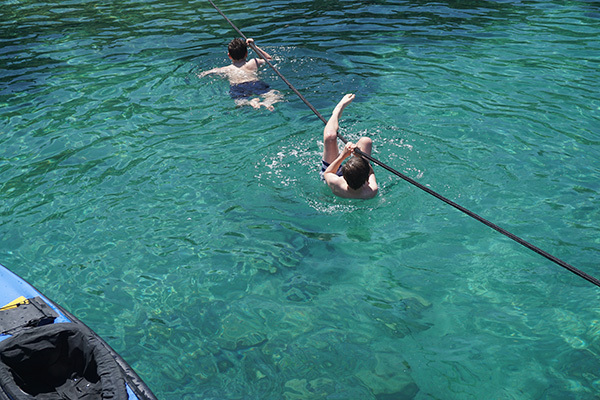 Mornings were spent swimming, paddle boarding, ringo-ing and waterskiing followed by delicious lunches on board. Afternoons were spent travelling to our next destination which sometimes meant two to three hours of motoring due to the lack of wind – but that wasn’t a problem. We all used to time to either take the helm, play games or read. Evenings were spent swimming, strolling around quaint Greek villages and eating great food either on board or in one of the local restaurants. If we were moored up in a bay then our skipper would take us, by rib, to the restaurant and then picked us up when we were ready. It was a great experience and the boys loved it, but what’s more, living in such close quarters we got some great quality ‘family time’ together. If you’d like to talk about your next holiday make sure you get in touch. THE ONE – the One Holiday, the One Experience, the One Not Like All Others! Accredited Body Member Luxury Travel Studio trading division as notified to the CAA is an Accredited Body member of Barrhead Travel Service Ltd and the Accredited Body’s ATOL number 5346. Book with Confidence. We are a Member of ABTA which means you have the benefit of ABTA’s assistance and Code of Conduct. All the package and Flight-Plus holidays we sell are covered by a scheme protecting your money if the supplier fails. Other services such as hotels or flights on their own may not be protected and you should ask us what protection is available. The Luxury Travel Studio ABTA number is P7195.